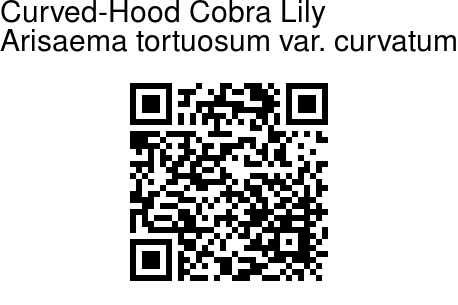 Curved-Hood Cobra Lily is a species of Cobra Lily with green hood, having whitish stripes. Leaves are usually 2, with 11-13 leaflets, which are linear to lanceshaped, 9-19 cm long, 0.6-1.7 cm wide. The spathe consists of a tube 5.4-5 cm long, cylindrical, gradually broadening into an ovate, pointed hood, larger than the tube. Spadix appendage is 8-19 cm long , stout, at first curved and then prolonged upright beyond the limb, black when dry. Curved-Hood Cobra Lily can be confused with Whipcord Cobra Lily, but that one has leaves with 5-7 leaflets which are broader, ovate to inverted-lanceshaped. 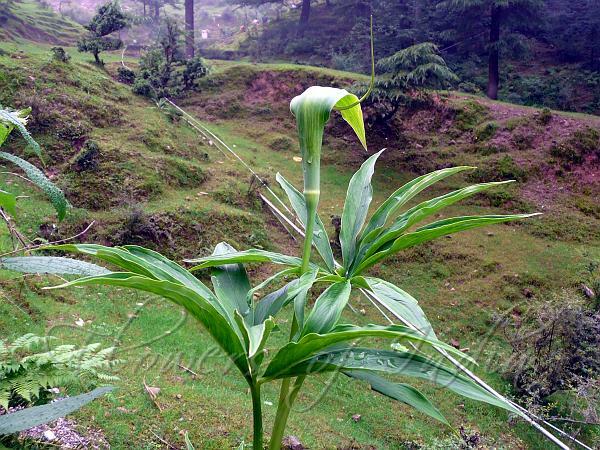 Curved-Hood Cobra Lily is found in the Himalayas, at altitudes of 1500-2500 m, from Shimla to NE India. Flowering: June-July. Photographed in Dharamsala, Himachal Pradesh.